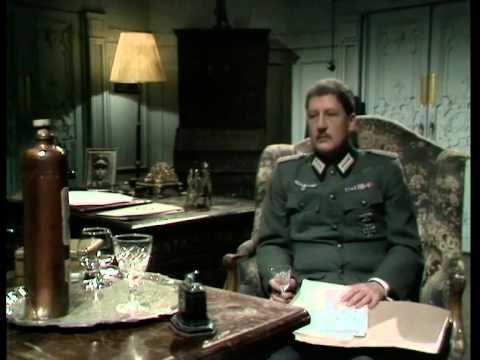 The Angriest: Colditz: :"Death Sentence"
It is 25 March 1974, and time for the penultimate episode of Colditz. Major Mohn may have departed from Colditz Castle, but Major Carrington still remains under a death sentence for threatening to kill him. As he execution approaches, Colonel Preston (Jack Hedley) impresses on the Kommandant (Bernard Hepton) that such a killing would amount to a war crime. As the American tanks approach, tensions within Colditz reach an all-time high. The oddest aspect of "Death Sentence" is that while the plot is primarily focused on Phil Carrington, the character - played by Robert Wagner - does not actually appear. It creates a weird sort of Waiting for Godot vibe throughout the episode; you keep expecting Carrington to turn up, and he never actually does. There is probably a behind-the-scenes explanation for his absence, but it sure does make this episode weirder than it was likely intended to be. Where the episode does wind up focusing its attention is on the Kommandant and Squadron Leader Tony Shaw (Jeremy Kemp). For the Kommandant it's the growing realisation that the war has failed Germany, and that it is only a matter of time before he will have to surrender to the British prisoners. With the increased bombing raids over Colditz town he is also forced to evacuate the families of the prison guards and officers into the castle grounds. This includes his own wife, with whom he shares some terrible news before the episode concludes. Bernard Hepton plays it brilliantly; the series is almost over, and it's fair to say he has done a remarkable job of humanising and developing a very difficult role. Pop culture tells us not to feel sorry for a German officer in World War II, but here we do. As for Shaw, he's spent half of the season obsessing over his secret glider. It is a remarkable achievement: an entire plane constructed out of scraps of wood and paper, hidden inside an attic under the Germans' noses, all set to fly Shaw and another man to freedom at a moment's notice. He wants that other man to be Carrington, however with the SS roaming the countryside on orders to shoot to kill and with the war so close to ending he is forbidden to launch the plane. The anguish on Shaw's face is palpable. He has dedicated so long to such a seemingly impossible task, and is forced into failure at the last moment. Jeremy Kemp is brilliant here, and it's testament to his acting prowess that you go to the end of the episode not quite sure which way his character is going to turn. The tension across this episode is immense. The war may be about to end, but as the chances of victory increase so do the chances that all of the prisoners will be killed by the SS before the Americans can get to them. It is all leading to what must be one hell of a climax in the final episode.